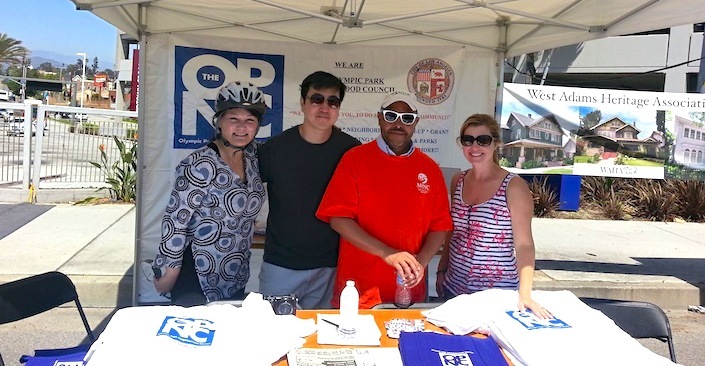 GM's message plus NC Awards, CicLAvia, and the Mayor says "Thank You!" I hope this newsletter finds you well. This week started early for me (or maybe last week didn't really end!) because I was trying to keep up with all the Neighborhood Council events around LA. On Saturday I stopped by the GM's Roundtable at our EmpowerLA Leadership Academy which featured LA's City Librarian, John Szabo. I didn't realize that besides books, our great library system, the largest in the country, offered so much more. For those who missed the Roundtable, there is an article below with video from Saturday. After that, I was happy to swing by the Valley's ONEgeneration Senior Symposium to thank nine of our Neighborhood Councils who supported and tabled the great event. 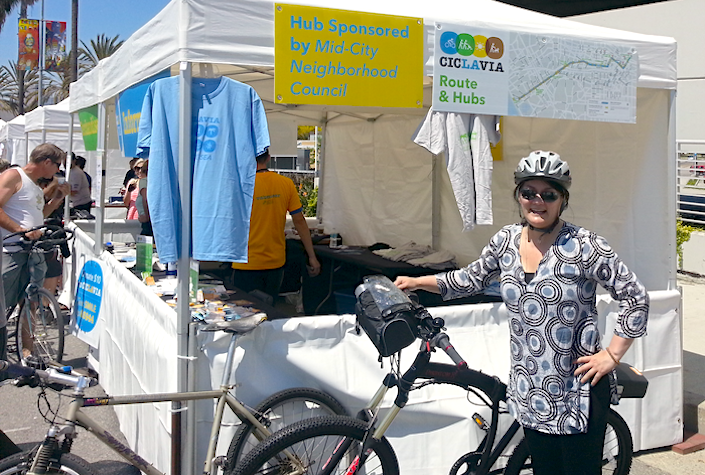 Sunday was CicLAvia to the Sea where I started riding from downtown and stopped to say hello and thank you to Mid City and Olympic Park Neighborhood Councils who sponsored a section of the ride. I admired the clean streets of Palms Neighborhood Council whose Board members made sure to do a clean up on Saturday before the event. I didn't get a chance to stop at the other Neighborhood Council tables along the route because I was racing to make it to Venice Beach, getting there just as they opened the streets again. After pizza on the famous Boardwalk, it was a long ride back to Culver City to take the handy Expo line back to 7th St in Downtown in a train full of bicycles and tired, but happy riders. 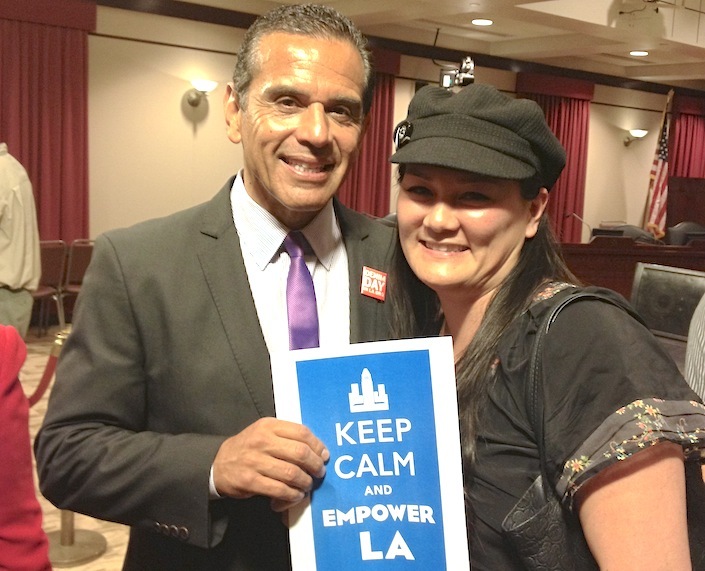 On Monday, Mayor Villaraigosa showed his support for Neighborhood Councils in his Proposed Budget by maintaining the Neighborhood Councils' yearly allocation at $37,000 for next year. 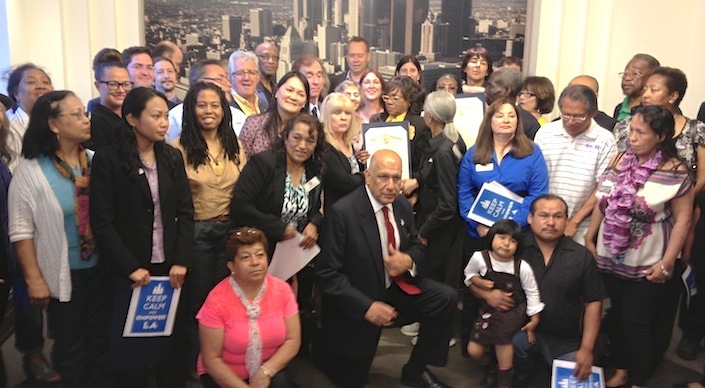 Neighborhood Councils were also appreciated in the Mayor's "The Future of Volunteering in Los Angeles" report released on Wednesday, and the Mayor again mentioned the importance of funding Neighborhood Councils in his Valley Town Hall that evening. I sent a short letter to Budget and Finance Committee requesting some additional funds be allocated to the Department from funding sources this fiscal year to next fiscal year to assist in reducing the burden on the General Fund. The Budget and Finance Committee will hold its hearing on the Department and Neighborhood Council budgets on Friday, May 3, 2013, in City Council chambers from 1 pm to 5 pm. Today, I was excited to celebrate our EmpowerLA Awardees being recognized in City Council, thanks to the Mayor's Office and Councilmember Zine. The Board of Neighborhood Commissioners will be opening up nominations for this year's awards soon so make sure to submit and be recognized for your hard work! I'm ending my week tomorrow with our EmpowerLA Leadership Academy, the VANC Candidate Forum and the launch of the Congress of Neighborhoods Planning Committee. If I don't see you there, then have a relaxing weekend! "Sorry you'll have to call the Los Angeles Police Department about that." "New people move in, and think they're living in Torrance" said Miguel Cordova, President of the Harbor Gateway South Neighborhood Council "and so they'll call in an emergency to the wrong city". Conversely, people will make calls into LA and get referred to Torrance. The zip code 90501 is more closely related to Torrance than Los Angeles, and as a result the lesser known Harbor Gateway community is often faced with these cases of mistaken identity. Mayor Antonio Villaraigosa has named Arnetta Mack of South LA to the Board of Neighborhood Commissioners (the Commission), for the term ending June 30, 2015, filling the vacancy created by Carlene Davis, who has resigned. 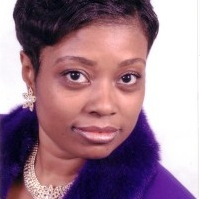 Ms. Mack is a veteran of the Neighborhood Council system, having served on the Empowerment Congress Central Area Neighborhood Development Council, the South Los Angeles Alliance of Neighborhood Councils, and the Neighborhood Council Budget Advocates.